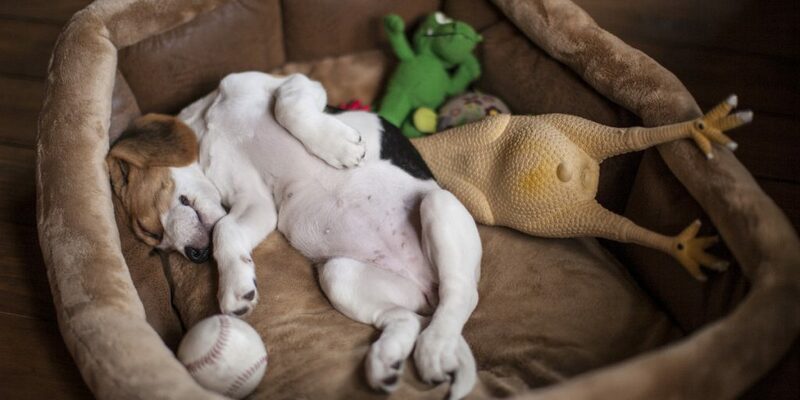 Your dog needs a good night sleep, just like you do! Dogs don’t always take to new beds right away, so buying a padded, comfortable bed for them to snuggle in to is always a great idea. You wouldn’t want to sleep on a cold, hard floor, so why would you expect your dog to? Of course, we can’t guarantee that your dog won’t sneak back onto the couch as soon as you go to bed (mine does this all the time – his panicked look when I get up early and he’s not had time to run back to his bed is hilarious!). But, if you do have problems with your dog sleeping on the couch, then a nice, comfortable bed of their own is a good way to change that behaviour. Of course, you should always check the manufacturer’s instructions first. All dogs smell – some worse than others! And they’ll spend a lot of time in their beds. Check to make sure your dog bed is either fully machine washable or has a detachable cover that can be easily washed. Many dogs prefer to sleep in an enclosed ‘den’, so pick the right dog bed for them. You should consider where and how they sleep without a dog bed. Do they prefer a cover? An enclosed bed might be a better choice if your dog isn’t taking to regular dog beds. When choosing a new dog bed, be sure to pick one that is big enough not just for them to curl up in, but to also stretch out if they want to. Just like humans, dogs like to stretch out their muscles too, so giving them room to do is key. It’s also worth remembering two important facts – younger dogs will grow, and it’s easier to train a new habit than break an old one. 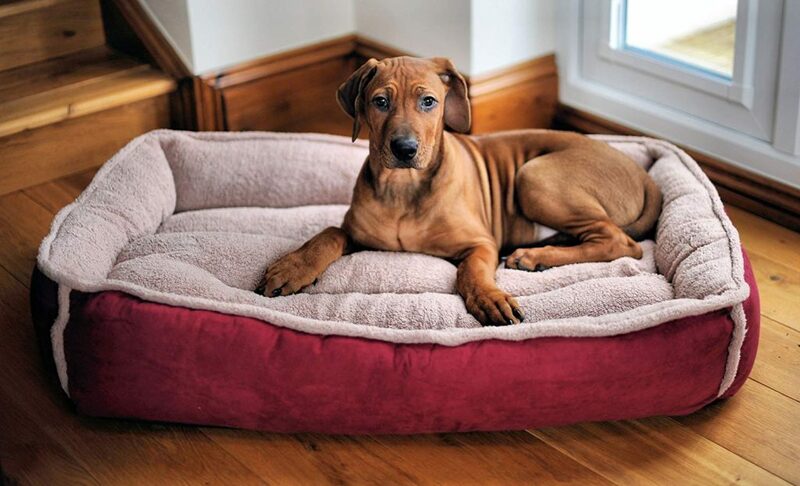 If your puppy outgrows its bed, there’s a good chance they will just be so used to it that they will prefer to keep using it – even if they don’t quite fit! A slightly larger dog bed can always be padded with a cushion or blanket if the dog is (currently) too small. A general rule of thumb for picking the right size of dog bed is to measure from its shoulders to the base of its tail. Then add around 6 inches and you’ll have a rough idea of the size of bed you need. Most beds come in standard sizes (small, medium, large) but the actual dimensions can vary from supplier to supplier. When in doubt, opt for the larger size. The Wolfybeds Padded Luxury Fleece Dog Bed is a fantastic, luxurious bed for mid-sized dogs and boasts a warm and cosy fleece interior, wrapped in faux-suede. This means it’s a stylish and practical addition to any home and fits in well with your decor. In fact, the only problem you may encounter is the happy sound of snoring as your dog drifts off for the night. The raised sides are great for dogs who like to rest their heads on a pillow, and combined with the comfortable fleece padding, most dogs will take to this bed without much coaxing. As the Wolfybeds Dog Bed can accommodate a mid-sized dog comfortably (the manufacturer recommends the product for Labradors, Boxers, Border Collies, Whippets, Weimaraners and Dalmations), it can also be a great joint bed for a pair of smaller dogs, who will have no problem snuggling up together as they fall asleep. One note though – the soft padding and covering means that this bed isn’t suitable for puppies, who will likely chew through it pretty quickly (along with everything else in their path!). As the covering (which simply zips over the padding) can be removed and machine washed, it’s easy to keep clean and odour-free. A blessing for those of us who have ever experienced the foul stench that inevitably results from an unwashed dog bed! What’s really great is the cover is reversible – one side is lined with fleece, which is warmer, and the other is lined with faux-suede which is better during period of warmer weather. It’s available in a range of colours, which means it will fit well in any home. When it’s time to treat your canine friend, anyone with a medium size dog should consider the Wolfybeds Luxury Fleece Dog Bed. The comfort it offers its occupant alone is worth the cost, and most dog owners who have bought this for their dogs have reported that they have had no problem getting their dogs to use it. The new PetFusion Memory Foam Dog Bed, is an orthopedic dog mattress that promises lots of comfort to your dog. This mattress combines several important favorable features. It is anatomic, it provides a solid yet comfortable environment for your dog and it has a unique design. The PetFusion Memory Foam Dog Bed is ideal for your house or your garden and it is made by premium materials that guarantee the product’s resistance against damages. It is actually made by a combination of premium quality polyester and cotton. The bed has a solid 10cm base that will provide your pet with the necessary comfort and protect it from health issues, like back or joint pain. Also, you can remove the cover easily whenever you wish to wash the mattress or dry clean it. The bed is ideal for medium or large dogs but you can still use it on a smaller pet. It will just have more space for itself! The PetFusion Memory Foam Dog Bed is a great choice for dogs who might be getting on in years and have a few aches and pains. The thick base to the bed gives them plenty of comfort and lets them rest their weary joints. The bed can be also be bolstered to allow for different lounging positions for your dog. While it’s slightly more expensive than other dog beds on the market, the high quality make and comfort it brings your old friend are well worth the price. The Bunty Polar Dog Bed introduced by Bunty is available in three sizes – small, medium and large to keep the dogs of all sizes and types warm and comfortable in a luxurious environment. 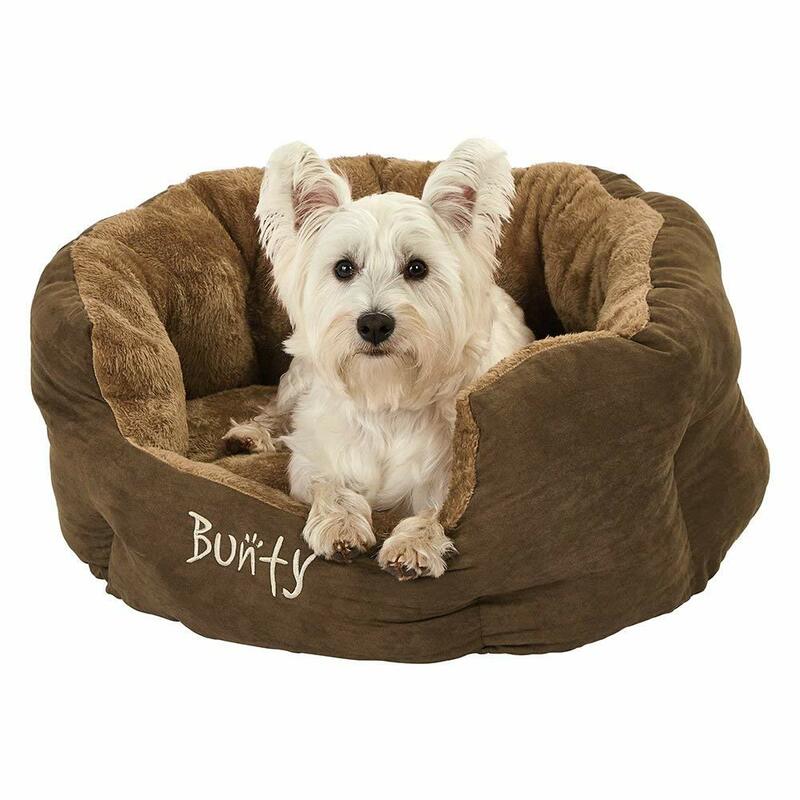 Bunty have developed a beautiful quality bed that will will not only fit well in any home, but be loved by any dog lucky enough to sleep in one. The bed is bolstered with high sides, which means it’s great for dogs who like to snuggle in and have a bit of protection, or even just like something to lean against. The thick, padded materials is really comfortable and clearly the result of years of experience from the manufacturer. The Bunty Polar Dog Bed is normally available in three sizes – small, medium and large but you can also get it in XL size on order, if required. It has been designed to keep your dog of any size or type warm and cosy. The high point of this dog bed is that it encloses the surroundings of your pet to provide him security all the time he is in it. It will keep your pet comfortable and warm all the time due to faux fur used to cover it. This dog bed has removable cushion inside it to make its washing easier. This is a fantastic quality dog bed and outstanding value for money. It looks great, fitting in with any home and the only real downside is you’ll find yourself looking for human-sized versions of it because your dog is comfy! Even though many dogs have a thick coat, we still worry about them as the winter comes along. As the nights draw in and the temperature drops, it can be difficult for even the fluffiest of animals to keep warm, especially in big open spaces and drafty houses. The Petnap Heated Tunnel lets pet owners worry a little less about this! It allows cats and small dogs to have a hideaway place of their own and gives them a sheltered heated spot. Petnap have also ensured its customers that their heated tunnel can be left switched on for long periods of time. No more worrying about the safety of previous heated beds and more time cooing over your perpetually snug kitty! The heat pad is separate to the exterior body of the tunnel which means you can easily remove the outer cover to wash either by hand or in the washing machine. Please do ensure that the product is fully dry before inserting the switched on heat pad into the tunnel. 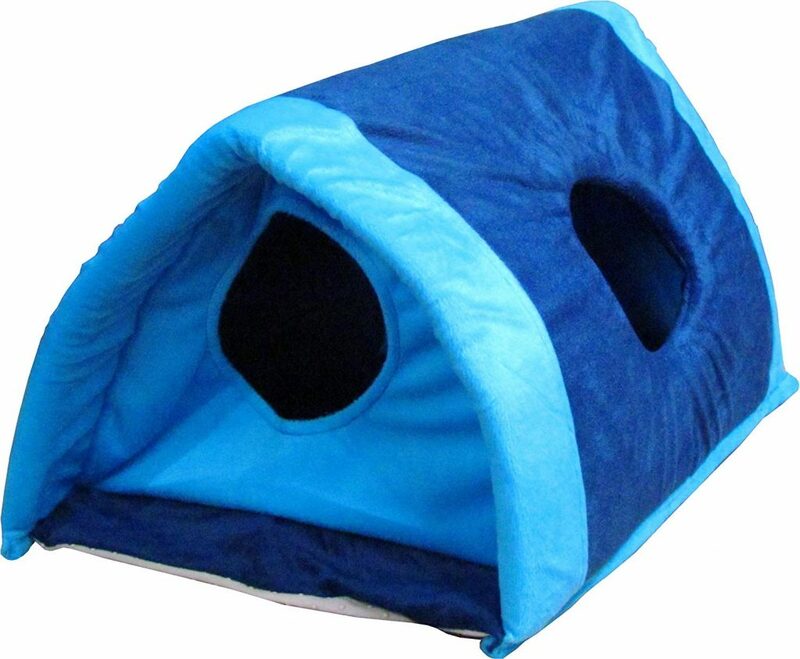 This heated tunnel comes in a lovely blue colour and the interior and exterior of the tunnel is soft, making it the prime napping spot for your pet – if only one for humans existed too! It’s difficult to imagine any pet that wouldn’t like a nice warmed heated pad to cosy up on, so the Petnap Heated Pet Tunnel is great for small dogs that might be colder during the winter months. Want to ask about dog beds? Ask away and we’ll try to help! I just can’t get my dog to use his bed! He’ll go into it when I tell him, but the second we’ve gone to bed he’ll jump up on the couch. It’s ridiculous – he knows he’s doing wrong as I can see the guilt in his face every single morning. But he keeps doing it! The first thing I’d suggest is looking at how comfortable the bed is compared to your couch? If he has a better option, he’s going to take it. I would! If the bed isn’t padded, then try lining it with some blankets or cushions. After that, you need to start to condition him to use it. Lead him over to it each night and give him a treat and some praise. Do the same each morning if he’s in his bed. He learn pretty quickly that he’ll get rewarded if he sleeps there. Make sure…make double sure…make triple sure…that your dog bed is MACHINE WASHABLE! I made that mistake and the stench that came from that damn thing was unbearable. We ended up having a ceremonial burning ceremony when we finally of rid of it! Dogs smell. Increasingly bad as time goes on. Haha sage-like advice! Thanks for dropping by! The relationship between dogs and humans is extraordinary. We are united by a powerful bond which can take work to establish, but is only strengthened over time. Have you recently diagnosed your dog with canine arthritis and did not know how to treat it or relieve it of its pain?